Want to entertain and grow your friendships but don’t have much time? Get nervous and stressed by entertaining? Hate to cook but love to decorate? If you said ‘yes’ to any of the above questions, the ideas in this post (and all of the Easy Entertaining articles) are for you! I want you to spend only 60-90 minutes, including prep time and cleaning time, to host a fantastic and tasty dinner party and I’ll walk you through how. Remember you opening your home and giving your friends a night off of cooking is all that counts! Things do not have to be perfect or anything close to it. So instead of killing yourself making homemade, gourmet food, and creating elaborate floral arrangements, just outsource and keep things simple! Pick a take out menu that’s a crowd pleaser. For this gathering I selected Seattle Icon Ezell’s Fried Chicken to do the cooking. 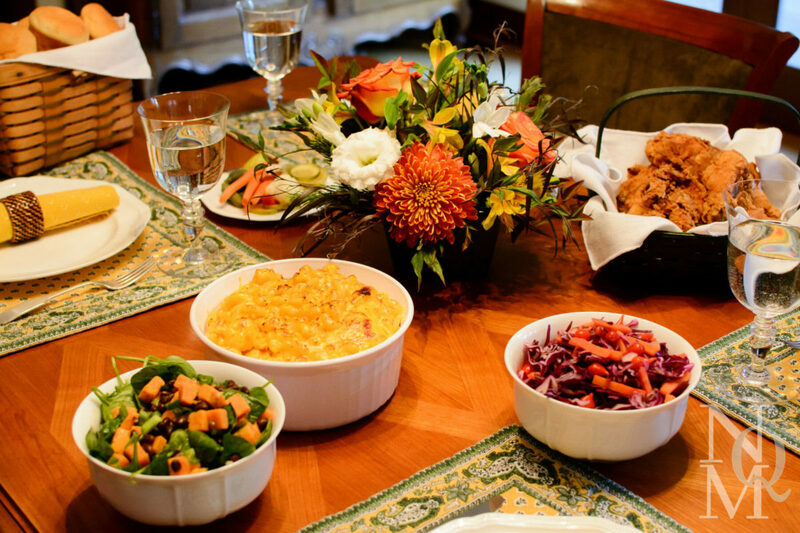 The menu included Fried Chicken, Dinner Rolls, Macaroni and Cheese, and NQM’s Sweet Potato Black Bean Salad. For dessert, Häagen-Dazs® Ice Cream Bars were a big hit and could not have been easier. If you want to up the Macaroni and Cheese ante, try Seattle fav Beecher’s, which is available these day’s in most freezer grocery sections, or offer the guilty pleasure of Stouffer’s® Mac And Cheese. One of my most discerning friends once asked me for the recipe when I served Stouffer’s®—LOL! Just remember that both frozen options take around an hour to bake. Most of the time with take out dinner parties, I avoid making any dishes myself but in the case of NQM’s Sweet Potato Black Bean Salad, I took the extra few minutes to make it (which pushed me a bit over my normal 60-minute goal mark) so that I could offer something healthy to counter balance the high calorie goodness in the rest of the meal. Another lower time option is a bag of salad that I often substitute homemade vinaigrette instead of the processed-provided option. People are so grateful to share time and food with friends that it’s far better to cut corners, stay sane and enjoy yourself.